On its face, what it wound up costing the Philadelphia Eagles to move all the way up to the second-overall pick in the 2016 NFL Draft doesn't seem all that steep. Basically, the Eagles gave the Browns three picks -- a first, a second and a third spread out over the next three years -- and swapped two others (they swapped first-round picks this year and this year's fourth round pick for Cleveland's fourth round pick in 2017). Sure, it's a hefty price, but when you compare it to what the Tennessee Titans were asking for the same pick in last year's draft -- and essentially the rights to Marcus Mariota -- it doesn't seem too bad. And yes, they were trying to move up from No. 20 to No. 2 at the time, which is going to demand a bigger return, but the Eagles reportedly offered two first-round picks (one a swap), a third-round pick, arguably the team's best player in Fletcher Cox, Brandon Boykin, Mychal Kendricks, and "more," which at one point included Sam Bradford. Still, it was not enough for the Titans. But the Eagles didn't just move up from No. 8 to No. 2 in this year's draft. Originally, they had the 13th pick, meaning they gave up more than just the picks mentioned above. How you respond to what comes next likely depends on where you currently stand on the trade announced by the Eagles on Wednesday afternoon. If you like the deal, you'll probably think this was smart maneuvering by Howie Roseman, and maybe even Chip Kelly. If you already think they gave up too much, then I apologize in advance for giving you the ulcer you don't yet know you have. In essence, you can add Kiko Alonso and Byron Maxwell to list of what it cost the Eagles to move into position to presumably draft Carson Wentz. Without that deal, they may not have been able to work out a trade with the Browns, partially because the second-round pick they would've likely had to include was sent to Saint Louis along with Nick Foles. That pick was later used against them when the Rams, not the Eagles, moved up to the No. 1 pick. As you can see, Kelly's fingerprints are all over this deal. And if you want to trace back to one singular moment, look no further than trade that sent LeSean McCoy to Buffalo for Alonso. See, the Eagles didn't trade just anyone to the Miami Dolphins for the right to move up from the 13th pick to the eighth. They traded Alonso -- and obviously Maxwell, but let's just focus on Alonso for a minute. Because the deal between the Eagles and Bills was a straight one-for-one trade, McCoy was, in a sense, a part of this deal. 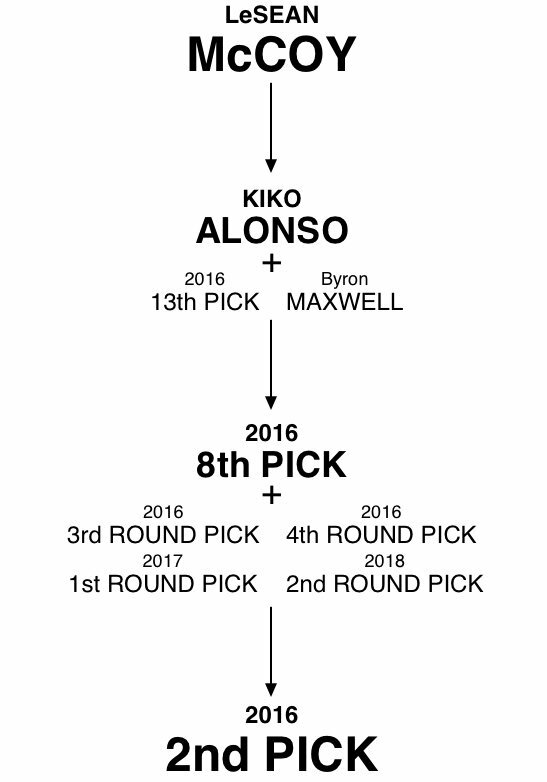 Following the path: McCoy becomes Alonso; Alonso (along with Maxwell) move the Eagles from 13 to eight; the eighth pick (and a few others) then allows the Eagles to move up to No. 2 overall. So however you want to do the math, don't forget that the actual price the Eagles paid to move up and draft who they believe will be their franchise quarter goes beyond the five picks (three if you don't count the swaps) announced on Wednesday. Whether or not that price was too steep remains to be seen. There are just too many unknowns at this point, especially surrounding the player (Wentz) they'll take second overall. But considering Alonso couldn't stay healthy last year -- and when he was, he looked like a shell of his former self -- and Maxwell never came close to living up to the $60 million contract he signed prior to the season, the Eagles seem to be off to a good start. Just remember, Roseman is simply cleaning up the mess Kelly left for him at this point. Or he's just making more of a mess down at NovaCare. We'll find out ... eventually.